Cross Hands is where the A48 dual carriageway can be accessed – a route to Carmarthen in the west and linking to the M4 Motorway 4 miles further south at Pont Abraham. Cross Hands comprises a bustling old village with a wide range of amenities including retail shops and commercial businesses, post office, bank, medical and dental centres, chemists, health & fitness club, cinema and well known superstores. There is also a large established Business & Retail Park with direct access via a link road off the A48 dual carriageway. 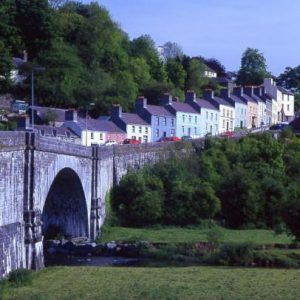 There are other delightful villages in the neighbourhood including Gorslas 1 mile, Cefneithin 1 mile, Penygroes 1½ miles, Drefach 3 miles, Mynyddcerrig 4½ miles and Tumble 2 miles. Schools Cross Hands primary school, Gorslas primary about 1 mile, Penygroes primary 1½ miles, Cefneithin primary 2 miles, Maesybont primary 2 miles, Llechyfedach primary at Upper Tumble 1mile, Tumble primary at Lower Tumble 2miles and there are others in the area. Maes-y-Gwedraeth Comprehensive School is located within the village of Cefneithin (taught in the medium of Welsh), Amman Valley Secondary School is about 5 miles easterly at Ammanford (taught in the medium of predominantly English) and Bro Dinefwr Comprehensive School (taught in the medium of predominantly English) is some 6½ miles northerly at Ffairfach, Llandeilo. Universities of Wales are located at: Carmarthen, 12½ miles westerly, Swansea, 18½ miles southerly, Lampeter, 26 miles north, Aberystwyth, 50 miles north, Cardiff, 54½ miles south-east, Newport, 60 miles south-east, and Bangor, 128 miles north. L lyn Llech Owain Country Park is within easy reach of Cross Hands. A minor road leading northerly from Gorslas village gives access to the park situated on high land with coniferous woodland surrounding Llyn Llech Owain. A natural glacial lake, being the source of the Gwendraeth Fawr river, which journeys south-westerly down to the sea at Kidwelly about 14 miles away. 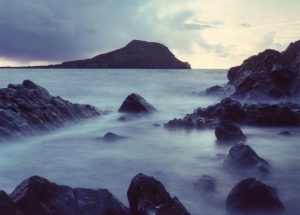 Legend has it that the lake was formed when King Arthur’s knight, Sir Owain, moved a stone that was holding back the waters of a mystical spring. The Park is a haven for wildlife with a variety of water birds to be seen and red kites and buzzards can often be spotted overhead. There is a car park and visitor centre and various footpaths to follow with lovely views to enjoy over the surrounding countryside. Mynydd Mawr Woodland Park is just to the north of Tumble village (about 2 miles to the south west of Cross Hands) with deciduous and coniferous woodland, wildlife ponds, footpaths and picnic areas. This was once the site of opencast coal mines now landscaped and returned to nature for the enjoyment of the local communities. In the early years of the 19th Century the famous Carmarthenshire Tramway ran from Gorslas down to Llanelli built by the industrialist Alexander Raby to transport locally mined iron ore and silica sandstone and limestone down to his iron works near the coast. Horses used to pull laden wagons along the wooden tram rails. Later, the Llanelli & Mynydd Mawr Railway Line was built along the route to link Llanelli with the collieries of the upper Gwendraeth and Llandybie to the east but this closed after the decline of these collieries in the latter half of the 20th Century. Most of the old line now forms the Celtic Trail Cycleway, which starts at Felinfoel in Llanelli, running past the Cwm Lleidi reservoirs, through the lovely countryside of the Gwendraeth Fawr valley, along the eastern side of Mynydd Mawr Woodland Park, past Tumble and up to Cross Hands at its northern end. The Trail can be accessed at numerous entry points along its course. 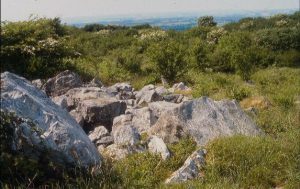 Mynydd Llangyndeyrn is about 6½ miles to the west, a mountain with several ancient stone monuments including a stone circle and burial chamber. Rising up between the valleys of the Gwendraeth Fach and Gwendraeth Fawr rivers near Crwbin, the mountain offers spectacular, far reaching views to all compass points. 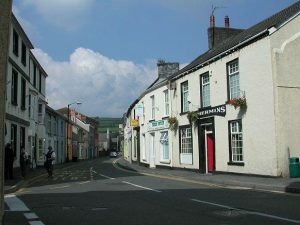 Ammanford is about 5 miles easterly standing at the confluence of the Amman and Loughor rivers offering a good pedestrianised shopping centre, a Friday market, a variety of restaurants, main post office, banks, infant, junior and secondary schools, a park, bus and rail links with the railway station being on the scenic Heart of Wales line, which runs from Swansea up to Shrewsbury over 121 miles through wonderful countryside. There is a swimming pool whilst other leisure activities catered for include bowls, tennis and snooker. Llandeilo is about 6½ miles northerly, a small, charming town off the A40 at the fringe of the Black Mountain area of the Brecon Beacons National Park with distinctive shops, galleries, pubs, hotels, good restaurants, main post office, health centre, schools, and a railway station also on the Heart of Wales line. Llandeilo dates back to the 13th Century, the church and town being named after the 6th Century St. Teilo. 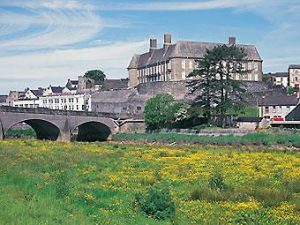 Standing in an elevated situation on the banks of the River Towy, the town was once the medieval capital of Carmarthenshire but the development of Llandeilo really grew in the 18th Century as a market town and banking centre for cattle drovers. It once had corn and woollen mills as well as a tanning industry and it is still an agricultural centre nowadays. The town retains its oldie worldly charm with narrow streets, historic Georgian buildings and a delightful old stone single-span bridge over the Towy built in 1848. Dinefwr Park – Just outside Llandeilo is Dinefwr Park, with a fine 17th Century manor house (Newton House), woodland, mill pond, fallow deer and white cattle and the Castle Woods Nature Reserve which offers a walk to the ancient Dinefwr Castle perched on a rocky crag commanding stunning views along the Towy Valley. This Welsh 12th Century castle was built by Lord Rhys (Rhys ap Gruffudd) and was the stronghold of the Princes of Deheubarth, rulers of south-west Wales in medieval times. It was later possessed by King Edward I as a royal fortress. 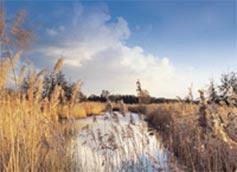 The river meadows are a haven for a variety of birds and other wildlife. The Brecon Beacons National Park extends from Llandeilo in the west to Hay-on-Wye in the east covering some 520 square miles and incorporates the Black Mountain massif to the west, the Fforest Fawr, the Central Brecon Beacons and Black Mountains Range to the east. The scenery is spectacular with diverse countryside including high mountain peaks, gorges, waterfalls, lakes, open hills and moorland as well as wooded valleys and lowlands with soft rolling farmland and clear meandering rivers. The park can be explored on foot, horseback, bicycle or by car and is a haven for wildlife with a wide variety of birds. There are Castles at strategic points on the boundaries of the Park – at Hay-on-Wye, Brecon, Trecastle, Tretower, Crickhowell and Carreg Cennen. 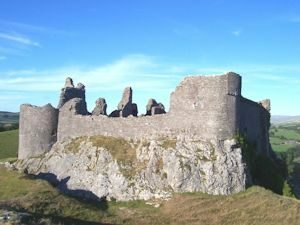 Carreg Cennen, Trapp – The Castle is a very popular attraction. Climb up to the Castle and enjoy the awe-inspiring views. Enjoy refreshments in the tearoom. The Castle is maintained by CADW, who preserve the architectural heritage of Wales. 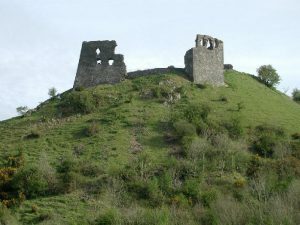 Dryslwyn Castle – The remains of Dryslwyn Castle are about 5½ miles northerly, standing atop a hill overlooking the river Towy. This Welsh castle was built and occupied by the Princes of Deheubarth on the site of an iron age hill fort around 1245. There was a famous siege of the castle by the forces of King Edward I in 1287 and many of his men were crushed by the falling walls as the castle was destroyed. 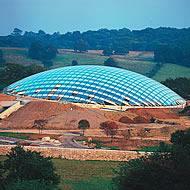 The National Botanical Garden of Wales is only 6 miles north-west of Cross Hands featuring the Great Glass House designed by Norman Foster. The glass house is the world’s largest single-span glass house and was funded by the Millennium Commission. The restored Gardens of Aberglasney and Gelli Aur (Golden Grove) Country Park are about 6 miles northwards. Carmarthen the ancient county town and commercial centre on the meandering Towy river is 11 miles westerly combining an oldie worldly charm of quaint narrow streets and traditional shops with bustling market and modern shopping amenities including well known stores such as Marks & Spencer, Debenhams, Next, Monsoon, Currys, Tesco Extra, etc.. There are night clubs, pubs, hotels, restaurants, theatre/cinema, art galleries, leisure centre, swimming pool, schools, university college, hospital, heritage centre and the County Museum on the outskirts at Abergwili. 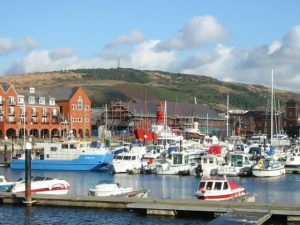 The town is served by good rail links through Swansea to Cardiff and main roads radiate out to all regions including the A40, A48-M4 Link, A484 and A485. The ruins of a Roman Amphitheatre are a town attraction and the remains of a Norman castle built circa 1094 are an impressive sight overlooking the town and the river. 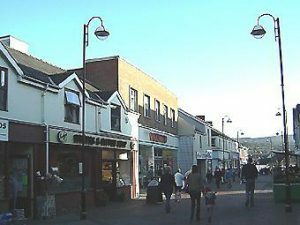 Llanelli is about 11½ miles to the south – an attractive town at the mouth of the river Loughor (the Burry inlet) providing good shopping amenities and a large covered market (the origins of the marketplace date back to the 13th Century) schools, college, cinema, railway station and the Prince Philip Hospital at the edge of town. There is an indoor bowls centre and a leisure centre with swimming pool, spa and sauna facilities, sports hall, squash courts, gymnasium, etc. 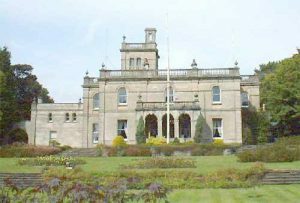 The impressive Parc Howard Mansion built in 1885, and bestowed to the town in 1912, is now home to a Museum and Art Gallery providing historical information about the town and area as well as collections of art and Llanelli pottery. 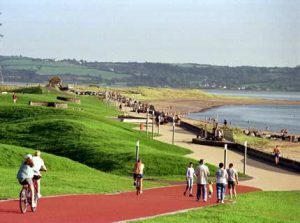 Coastel Park – Opened in 2002, the Coastal Park is at Llanelli’s shoreline offering beaches, dunes, salt marshes, water sports centre, fishing lakes, woodlands, public art, a golf course, visitor centre, superb views and a long connecting footpath and cycle track. Some 2,000 acres of neglected wasteland was reclaimed along about 14 miles of coastline to bring back the natural seashore environment for people and wildlife to enjoy along with the Coastal Path which runs between the National Wetland Centre and Pembrey Country Park, providing a splendid traffic-free route. 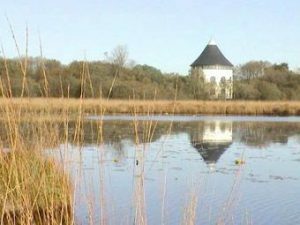 The National Wetlands Centre near Penclacwydd is about 15½ miles south of Cross Hands – a nature conservation reserve at the edge of the Burry inlet (Loughor estuary) with lakes and reed beds where the little egret, ducks, swans, geese and a variety of other wild birds can be seen. Swansea, the second largest city in Wales is about 18 miles southerly with plenty of shopping and leisure amenities, a large indoor market, schools and university, general district hospital, theatres, concert halls and museums, bustling marina, bus and railway stations and a good night life with numerous clubs, bars, cafes and restaurants. Beautifully set on the sweeping Swansea Bay shoreline, the city has sandy beaches with safe bathing, an excellent Yachting Marina and Maritime Quarter, waterfront bars and eateries, museums, art galleries, the National Literature Centre (dedicated to Dylan Thomas, who was born in Swansea) and an observatory. Swansea has a number of fine public parks including the extensive Clyne Gardens & Country Park with follies, streams, bridges, and a castle as well as superb views across the bay and Singleton Park which has a Swiss cottage, boating lake, and botanical and herb gardens. 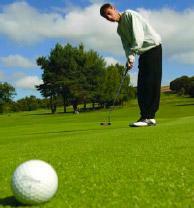 There are several golf courses around Swansea and the nearby Gower. Swansea docks attract the cruise liners whilst ferry links to Rosslare in Ireland can be accessed at Pembroke Dock, 45 miles south-west of Cross Hands and at Fishguard Harbour 48 miles westwards. Cardiff International Airport is 50 miles to the south-east. Kidwelly is about 14 miles south-west of Cross Hands, a small, historic, coastal town believed to date back to c.1115, and dominated by an impressive, well preserved Norman castle built in the reign of King Henry I. The Normans built other fine castles in this neighbourhood during the reign of Henry I – at Laugharne, Llansteffan and Carmarthen. Kidwelly stands at the mouth of the Gwendraeth river as it joins the Towy estuary before entering Carmarthen Bay. On the edge of town is an industrial museum. 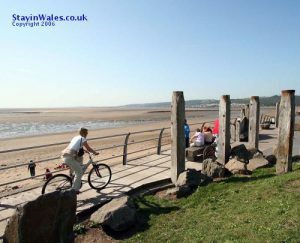 Pembrey Country Park is 15miles south-west of Cross Hands, adjoining the peaceful sand-duned, 7 mile expanse of Cefn Sidan Beach stretching across the Pembrey peninsula. The Country Park provides hundreds of acres of parkland and forestry with walks, nature trails and picnic areas along with attractions such as pony trekking, cycling, a dry ski slope, and a salt marsh nature reserve. Past Pembrey en route to Kidwelly is the Pembrey Circuit, a centre for motor sports, autocross, go-karting, and 4×4. 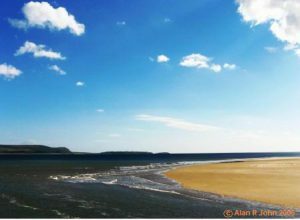 On the western side of the Towy estuary, some 27 miles south-west of Cross Hands, Pendine offers miles of sandy beach (where Sir Malcolm Campbell set world land speed records in the 1920s). 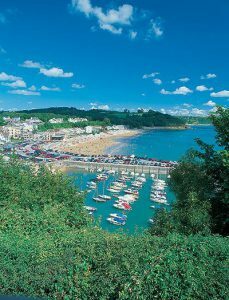 Pembrokeshire – To the south-west, the popular resorts of Saundersfoot and Tenby in the Pembrokeshire Coast National Park are some 36 miles and Oakwood Leisure Park, one of the UK’s top theme parks is 35 miles distant. To the north-west, on the Heritage Coast of Cardigan Bay, famous for porpoises, dolphins, and seals, New Quay is 37½ miles distant and the Georgian town of Aberaeron about 39 miles distant.